The report outlines how some sports and all energy drink products are being misused, discusses their ingredients, and provides guidance on their appropriate use, as in the case of sports drinks, and on how to decrease or eliminate consumption by children and adolescents, in the case of energy drinks. The report recommends that children and adolescents be taught to drink water "routinely as an initial beverage of choice" and "generally [as] the appropriate first choice for hydration before, during, and after most exercise regimens." It says sports drinks should be reserved for "youth who exercise with prolonged vigorous intensity [where] the need to supply an appropriate carbohydrate energy [source] to avert fatique and maintain performance" makes consumption of a sports drink appropriate. A recent study shows that sports drinks measurably enhance endurance in youth athletes who play stop and go sports lasting an hour or more such as hockey, lacrosse, football, soccer, basketball, field hockey, rugby, and volleyball. Sports drinks are also recommended in hot, humid conditions when an athlete can lose a significant percentage of his body weight through perspiration and needs to replace electrolytes and fluids, as well as by athletes engaged in intense training. Commenting on the report, MomsTeam hydration expert, Susan Yeargin, Ph. D., ATC, an Assistant Professor in the Athletic Training Department at Indiana State University, suggested to parents of children who are very active or are involved in organized sports: "If during or after exercise a child does not like the taste of water, it shouldn't be forced upon them. As long as they are being active and obesity is not a problem, then [consumption of] a sports drink should be encouraged, because we know the carbs, salt, and flavor encourages children to drink." Another option," she suggests, is "to explore flavored water if the exercise hasn't been very intense or weight is a concern for the child since we know flavor seems to be a big determinant in getting children to stay hydrated as compared to plain unflavored water." With respect to the replacement of electrolytes, Dr. Yeargin agreed withthe report that electrolyte intake in children is usually "taken care of by normal dietary intake," but also, as the report noted, that there were"some situations, particularly in the heat, or in the setting of prolonged, vigorous exercise, in which electrolytes foundin sports drinks might be warranted, and encouraged parents to remember" that severe electrolyte abnormalities can occur in each of these settings and and, as the report notes, "are serious and potentially life-threatening." One problem, Dr. Yeargin noted with the report, is that while it gives great examples of when sports drinks should be used (prolonged, high intensity exercise and sports tournaments), it doesn't define what is meant by "prolonged." "A parent will need to decide for themselves if a child athlete who has just finished a practice or game warrants a sports drink, particularly practices and games in the summer warmth and heat, "which would also warrant a low calorie sport drink [such as Gatorade G2] or a flavored water, if it is of significant length or the environment resulted in the child sweating a large amount. I don't want parents to think that 'prolonged' means 4 hours or more. It could be a lot less than that depending on the situation." "The more intense the activity, the less comfortable kids are drinking fluids," added Dr. Leslie Bonci, Director of Sports Nutrition at the University of Pittsburgh Medical Center, author of Sports Nutrition for Coaches, and a mom to sports-active kids. "Flavored sports drinks not encourage hydration but safeguard kids' health while optimizing performance, but, for competitive athletes should be considered part of a kid's equipment. Parents have one shot to do it right. There are no do overs," Dr. Bonci said. Her advice to parents: remember the acronym SHOP: safeguard health, optimize performance. Sports drinks and energy drinks are different products, said Holly J. Benjamin, MD, FAAP, a member of the executive committee of the AAP Council on Sports Medicine and Fitness, and a co-author of the report. "Sports drinks are beverages that may contain carbohydrates, minerals, electrolytes and flavoring, and are intended to replace water and electrolytes lost through sweating during exercise. In contrast, the term "energy drink" refers to a very different type of beverage containing substances that act as nonnutritive stimulants, such as caffeine, guarana, taurine, ginseng, i-carnitine, creatine and/or glucuronalctone, with purported ergogenic or performance effects. The problem, notes the report, is that "adolescents do not differentiate between sports and energy drinks and [in a 2003 survey] cited the same benefits for both. None of the adolescents surveyed mentioned potential problems referable to the consumption of these beverages, and they did not distinguish use on the basis of the degree of athletic participation." "Sports drinks have an important, specific role in the diet of young athletes who are engaged in prolonged vigorous sports activity - primarily to rehydrate and replenish carbohydrate, electrolytes and water lost during exercise. However, confusion about energy by young people can lead to unintentional ingestion of energy drinks when their goal is simply to rehydrate and replenish carbohydrate, electrolytes, and water with sports drinks. Using energy drinks instead of sports drinks for rehydration can result in ingestion of potentially large amounts of caffeine or other stimulant substances and adverse [health] effects." "In many cases, it's hard to tell how much caffeine is in a product by looking at the label," Dr. Schneider said. 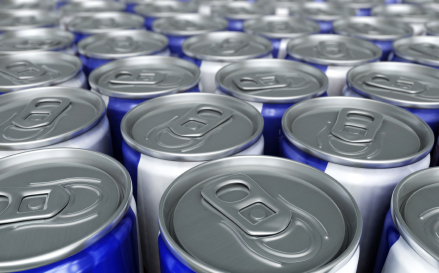 "Some cans or bottles of energy drinks can have more than 500 mg of caffeine, which is the equivalent of 14 cans of soda." The report notes that such levels are "clearly high enough to result in caffeine toxity," noting that a "lethal dose of caffeine is considered to be 200 to 400 mg/kg." "There is no place for energy drinks in school, play, or sport for children nor adolescents, and dare I say adults," echoed Dr. Yeargin. 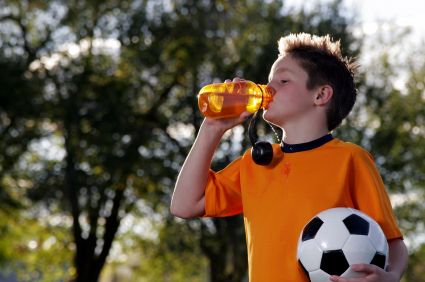 Routine ingestion of carbohydrate-containing sports drinks by children and adolescents should be avoided or restricted, because they can increase the risk of overweight and obesity, as well as dental erosion. [Again, the key here, for sports parents, is the use of the word "routine"; e.g. outside of a sports setting as a beverage with meals]. Sports drinks have a specific function for pediatric athletes; they should be ingested when there is a need for rapid replenishment of carbohydrates and/or electrolytes in combination with water during prolonged, vigorous physical activity. 1. Scheider M, Benjamin H, Clinical Report - Sports Drinks and Energy Drinks for Children and Adolescents: Are They Appropriate? Pediatrics 2011; 127(6): 1182-1189.